If making a beer from scratch weren't so difficult at times, it wouldn't be worth it to Jake Wade. It can't be just any beer. It must be a draft beer that develops a loyal following with a taste — light or heavy — that lasts long after the glass is empty. "You're making a product from raw materials," he says. "That's what I like about it. I feel like I'm at the core of something good, something that people will enjoy. It takes energy, but the important thing is, it takes patience." Patience helped drive Wade and his three older brothers' willingness to wait three years before pulling taps for the first time last month at Bearpaw River Brewing Co. in Wasilla, pouring either an IPA, a stout or a Belgian beer. When that happened, Bearpaw became the fifth Alaska craft brewery to open in 2015, a year that also saw several significant expansions at established facilities, helping drive what may have been the industry's strongest year since Juneau's Alaskan Brewing Co. ignited the state's craft brewing industry 30 years ago. 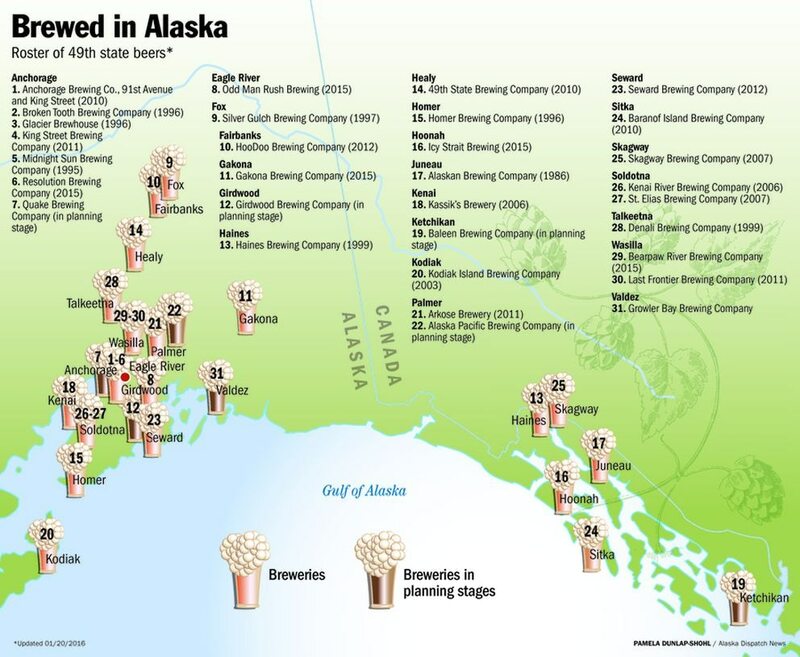 Since that fateful December 1986 day, more than two dozen Alaska breweries have started production — some producing as little as a dozen barrels per year, with much-decorated Alaskan Brewing ramping up to more than 160,000. For some brewers, making and selling craft beer represents a second career rooted in a love of home brewing. For others, it's an investment in a passion while still holding onto a day job. For the Wades, it's a little of each. The oldest, 37-year-old Jack, is considered the brewery's numbers guy while still working as a physical therapist in Wasilla. James, 35, a medieval English professor at the University of Cambridge who returned for one month to assist with the opening, lends his writing talents to the business. Jed, 30, who works for Providence Health & Services, handles company logistics and assists with the brewing. The youngest, 28-year-old Jake, is the only full-time employee with experience brewing, which he got while living in Idaho. While working on recipes, Jed and Jake consulted out-of-state brewers as well as those nearby in Talkeetna, Kenai and Anchorage, getting tips on starting the business and purchasing equipment from companies such as Anchorage's King Street Brewing Co.
"It speaks to the community of brewers and how everybody is willing to help out, which I think is unique to the industry," Jed said. "We were very meticulous. Now, a lot of things look the way we want them to and not as if they were rushed. It was worth the wait." Alaska's brewery newcomers have set up shop in such high-traffic settings as Anchorage, Wasilla and Eagle River, but seeing how smaller, almost self-contained markets such as Kodiak and Sitka have succeeded, rural areas continue to attract new brewers, too. Gakona, with a population of about 210, sitting at the confluence of the Copper and Gakona rivers and 15 miles northeast of Glennallen, began enjoying a local brew in September. Brewer Ed Miner, a civilian worker for the U.S. Coast Guard, says local demand drove his decision to enter the commercial market, but for now he operates on a rotating six-month permit, his first lapsing Jan. 1. He sells his Gakona Brewing Co. blends at Texas Roadhouse in Anchorage and the Trappers Den Tavern at the Gakona Lodge. Miner says as much as he's answering a call from area friends to sell his product, he's also targeting tourists — so his next permit starts in May. "I know a lot of people who go into a bars and restaurants ask for what's local, so for us to have something that's produced in the Copper River Valley, it's pretty important," says Miner. A month before Miner began selling, Dan Kane and Todd Thingvall kicked off Icy Strait Brewing in Hoonah in the state's Southeast region, where craft beers help kick off and close out summers with brew fests in Haines and Juneau. Initially, he and Thingvall thought of converting a century-old house on Hoonah into a restaurant, but Kane says they quickly changed plans. Thingvall is the craftsman and Kane, a retired Alaska Airlines manager, is the brewer, so they converted the waterfront house into a place for locals. "People here are willing to try something new," Kane says. "For them, it's a badge of honor to have their own brewery. This is their brewery as much as it is ours." Geographic diversity is a hallmark of the Alaska brewing landscape, says Julia Herz, program director for the Boulder, Colorado-based Brewers Association. "Despite the challenges of geography and costs, and resources often difficult to access, Alaska has a thriving beer culture," she says. "It's not stuck in the '80s, and that's a beautiful thing. "What you have in Alaska are hearty people who are full of spirit and soul. The community and culture for craft beer there is strong, and it's getting stronger." The 2015 brewery surge began in March when Brandon Hall opened Resolution Brewing Co. on Mountain View Drive, convinced that Anchorage — already teeming with established brewers like Midnight Sun Brewing Co. and emerging tastes from King Street and Anchorage Brewing Co. — has room for more. "Beer is wonderfully subjective," Hall says. "That's one of the greatest things about it. To go from good to great is where the culinary expertise and the style comes in. So for me, even if I don't like the beer, I can tell if beer is crafted well, and I've always appreciated that. That's what's happening in Alaska." Six months later, longtime Eagle River friends Brian Swanson, Ross Johnson and Reid McDonald opened Odd Man Rush Brewing. Swanson is a former professional hockey player who had stints with the Edmonton Oilers organization, in Europe and with the Alaska Aces. He says that while the hockey theme may be obvious at the brewery or in beer names (pumpkin ale Gourdy Howe and Enforcer IPA), the beer once brewed in McDonald's garage is designed to have local appeal. "When you start making beer, you learn the basics, then you start reading, then you start reading and doing your homework — on everything, the industry, the products, the ingredients. "Then you see how amazing this is, and so do people in your community." Herz says Alaska's growth tracks nationally. Before 2015, Alaska stood eighth in the number of craft breweries per 100,000 people, at almost five. That standing could get a boost when updated survey numbers are published later this year. Although she's never been to Alaska, Herz says she's met several Alaska brewers and has kept a curious eye on developments from established Alaska brewers who've gained acclaim for their beers and creative business development. "Opening a brewery now has become one version of the American dream," she says. "Craft brewers often use their beers as cause for other causes. They are so integrated into the community, they use their brewery business and their beers to further that community." Thirty years ago, Alaska had no craft beers, at least none brewed in this state. In 1986, Alaska was still reeling from the high-profile closure of Anchorage's Prinz Brau, which created ominous doubt for future endeavors while leaving people to wonder, if well-funded, experienced German brewers couldn't succeed, how could anyone? Juneau's Geoff and Marcy Larson, however, believed the time was right and, with the financial support of 88 friends statewide, jump-started Alaska's craft brewing industry with Alaskan Brewing. What followed for the Larsons were 30 years of experiments and an approach Geoff Larson says requires doing things differently rather than trying to just do it better. • Using a fish smoker from former business neighbor Taku Fisheries, ultimately producing a "hedonistic" taste that has been a perennial winner among national breweries competing at the annual Great American Beer Festival competition for nearly three decades. • Installing a carbon dioxide recycling system in 1998, despite being told the operation needed to be 100 times to 1,000 times bigger to efficiently use such equipment. At the time, Larson thought, "The technology is there, you just have to seize it." • Converting to a mash press in 2008, a change Geoff Larson says is akin to trading in a drip coffee maker for an espresso machine in order to more efficiently extract sugar from grain while using less water. "We live in very innovative times," Larson says. "What couldn't be done before can be done today. In Alaska, people live with that attitude. There is always that element that challenges you, even with brewing. You're venturing on new turf because it's never been done before. "We are a very large state, but we have very few traditional urban resources. Those challenges created a little bit of a mindset 100 years ago and still today. The fact that it hasn't been done really presents a challenge because there are many other attributes to figure it out and do it a different way." For instance, over the last four years, the Larsons have been integrating a new boiler powered by dried, spent grain. The company received a federal grant to reconfigure its operations, which they believe will cut fuel consumption 80 percent and help recycle its spent grain. According to the Brewers Association, Alaska beer production from 2011 to 2014 rose 27 percent to 200,500 barrels. Of that, Alaskan Brewing produced 161,000 while newcomer Bearpaw River will aim for 1,000 barrels this year. But even as the state's largest microbrewery, Alaskan Brewing is growing. Last year, it expanded its campus, located about 7 miles north of downtown Juneau, to facilitate more efficient packaging. In addition, the brewery now operates two downtown retail outlets selling merchandise — shirts, hoodies, glasses — separate from the manufacturing operations. City regulations prevent the retail stories from selling beer, but the brand is strong enough for Alaskan Brewing to open a second smaller, more seasonal retail shop to supplement the year-round store. At the same time new brewers emerge, some established brewers are expanding. In Talkeetna, Denali Brewing Co. has emerged as second in beer production among Alaska brewers, having been in business since 1999. Owners project growth for another five years. Haines Brewing Co. left its home of 16 years at the Southeast Alaska State Fairgrounds for newer and bigger digs on Main Street. The brewery basically went from a tasting room that can hold 16 patrons to having room for 49-plus others at an outdoor beer garden. In Anchorage, longtime brewer Gabe Fletcher went from leasing basement space at the Snow Goose, since acquired by 49th State Brewing Co. of Healy, to opening his own facility on 91st Avenue off King Street. In this case, the facility is new, the brewer is not. Fletcher started 19 years ago at an Anchorage favorite, Midnight Sun. Fletcher, who promotes his beer's unique style for its wood fermentation, says beer lovers are taking a greater interest in what they drink and seeking new flavors. "Twenty years ago someone would go in and try a microbrewed beer, not like it and go back to doing what they were doing before," he says. "What's changed is now people are so much more educated with beer and there is so much more social media surrounding it." Four years ago, King Street Brewing celebrated its first sale at Humpy's Great Alaskan Alehouse, the popular downtown Anchorage dining and drinking spot. Co-founder Dana Walukiewicz, however, quickly found himself facing a choice: Keep the brewery small and maintain his job as a chief financial officer with an Alaska Native company or take his passion full time. The notion of him and partner Shane Kingry operating on weekends and a few weeknights with some part-time help quickly disappeared. Today, backed by 10 employees and with Walukiewicz working full-time, King Street is sold in 90 retail locations. "We (Walukiewicz and Kingry) were nervous when we first opened," he says. "Most of us were home brewers," he says. "Our friends and relatives loved our beer, and that's great. "That doesn't mean we would be able to sell it. We quickly found there was a strong demand and great acceptance for our beer and the local public." Alaska's craft brew industry's spike happened so fast that even as two books featuring Alaska breweries hit store shelves this year, both already need further editions. Beer blogger Bill Howell penned "Alaska Beer: Liquid Gold in the Land of the Midnight Sun," a look at the state's brew history. Katie Devereaux and Clint Farr released "Beers of the North: A Field Guide to Alaska & The Yukon." They may have to make room for another batch of brewers planning to open in Anchorage, Palmer, Girdwood, Valdez and Ketchikan. "Anytime you do something different, it's rare that it's going to be an overnight success," Larson says. "Everything takes time. There is no way we would have ever conceived the beer industry changing the way it had. It's good to see." Steve Quinn is a Juneau-based freelance writer. *Correction: An earlier version of this story misspelled Todd Thingvall's name. Also, Icy Strait Brewing is located in Hoonah, not Groundhog Bay, and is closed for a few months each winter and not open year-round.